Blue Backpackers Hostel i Busan, Sør-Korea: Bestill nå! 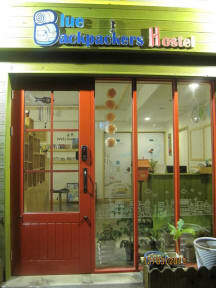 Blue backpackers is a clean and comfortable,friendly hostel for travellers. It has a common room with a Tv, computer for internet and all equipped kitchen. All rooms with a fan,air-conditioner,bathroom,floor heating. - 10mins.walk from Seomyeon subway station. *Hair dryer,washing machine,iron,tourist information with a map,ticket booking for a train,ferry,flight are also available.